Honestly I don’t know what to call this show as a whole. This post is mainly focusing on the story and characters from mostly the Cast Album Point-of-View. I will not get into any aspect from the technicals of the show itself. And instead of me being all nit-picky, I’m going to try to keep this as general as I can, so no mention of Phoebus’ last name or the wars. The stabbing thing is a different point. I do think of the biggest weakness is actually the idea of the show which was merging the Disney movie and the book. The real trouble is they were working with three different mediums of story telling; a Book, A Movie and a Broadway style musical. It’s no easy task, things that work in one do not work in the other two. Another trouble is they pretty much had to keep the Disney movie fairly intact within the show which ruined other aspects of the show, namely Frollo as a whole. It just seems to a case of them adding book stuff to the movie story and didn’t really think about what they were doing so along as it didn’t mess with the movie stuff. Case in point, Frollo. Frollo in this version is a very weird mash-up of Book Frollo and Disney Frollo and I don’t think it was super effective in this version of either story. You can make the argument that this Frollo is his own thing but the point of this musical is combine the Disney movie and the book in a workable combo. 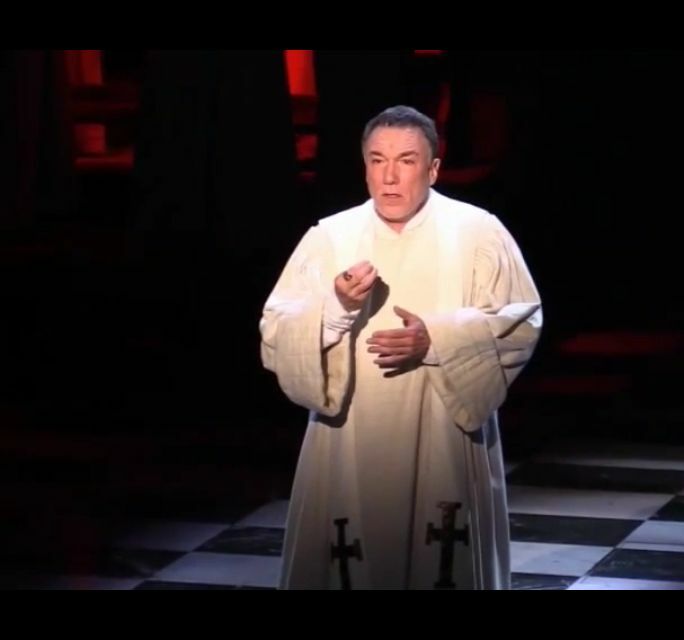 A big thing wrong is that Frollo really keeps his composure throughout the musical even Hellfire is super controlled. I really didn’t see or hear the lust for Esmeralda taking control of him. Nor did he get jealous towards Phoebus or even Quasimodo for Esmeralda being nice to him. I didn’t see either book Frollo or movie Frollo in this one. It really comes down to some of the decisions the show takes with the two sources that leads to the some of the weakness of the show as a whole. The first is the opening with Frollo and Quasimodo’s backstory. The show brought in Jehan, Frollo’s little brother from the book. If you have read the book you would know Frollo was much older than his brother and didn’t know about him till their parents died. So when Frollo saw Quasimodo abandoned in Notre Dame he is moved by empathy thinking about how Jehan could have been in Quasimodo’s position. In this musical Quaismodo is Jehan’s son making Frollo Quasimodo’s uncle. This family connection waters down the relationship between the two and is actually never mention in the musical as a core plot point. It doesn’t add anything. Frollo had a brother, so what? Is that really a better back story than Disney movie or the book? It just seemed like they wanted to work in Jehan somehow. The another scene a combo of few scenes. So in the book Esmeralda and Phoebus have a meeting at house which ends with Frollo stabbing Phoebus and Esmeralda getting blamed for the crime. The musical has this scene sort of but doesn’t do much with it aside from an awesome song. In the show Frollo walks the city looking for Esmeralda and one night he sees her in a bar where she kissed Phoebus. That’s it. Sure, it gives some insight to Phoebus and Frollo’s desperation but not enough. It just seems like they wanted that scene but could only work in so far and then added the whole stabbing thing later. As Phoebus is getting his character arc he says no to burning a building and Frollo sentences him to die. Esmeralda then appears and helps Phoebus, then Frollo stabs Phoesbus AND then blames Esmeralda and that is one of her crimes. Am I crazy or that dumb? Am I going insane? The whole stabbing which a driving force in the book in shoehorned in this show in a near insulting manner. Unless she stabbed another officer? There was a fight scene but still it’s an after thought. But here is the thing instead of doing the Inn/Tarvern scene properly which would have meant probably switching Hellfire and Thai Mol Piyas it also meant forgoing the whole burning/search for Esmeralda as well as changing Phoebus’s character arc a bit ergo they went for the Disney story and just threw it where they felt like. And that is weakness of the show as whole and an overdose Disney with pitch of the book. It’s like they were baking a cake and were told that chile and chocolate go well together, so instead of adding ground cayenne pepper they just added some crushed up Jalapeño to a cake box cake. There’s another hunchback adaptation I think you should review, after the other Burbank one – Quasimodo d’El Paris. It’s a French movie that’s also a modern day adaption. It’s in French, but there’s a translation on YouTube.